"Account Holder" means any entity or organization that subscribes to the Services. "Account Information" refers to information obtained from Account Holders or Administrators in the process of creating, maintaining, or administering the Boardpaq Services. It does not include information uploaded to Boardpaq Services by Account Holders or Administrators. "Authorized User" refers to a user of the Boardpaq Service who is authorized by an Account Holder to access and use the Boardpaq Service. "Administrator" refers to the individual(s) who has/have been designated to control and administer the Account Holder's account to use the Boardpaq Service on behalf of Account Holder. We collect "personally identifiable information" and "device information" from Account Holders or Administrators. We may also collect device information from visitors to our Site. "Personally identifiable information" is information that tells us who you are, such as your name and email address. "Device information" is information collected from your computer or mobile device whenever you visit or use our Services (whether through the Site, Web APP, iOS APP, Windows APP or otherwise), including your IP address and technical data and related information regarding your device. We do not collect personally identifiable information from content stored on our system by Account Holders or Administrators. The Account Holder or Administrator controls all content, access or use of any information uploaded through Broadpaq Services. We may collect personally identifiable information such as your name, email address, home or business address, and phone number when you register and/or use our Services or if you otherwise provide it to us as an Account Holder or Administrator. We may also collect personally identifiable information such as your name, email address, home or business address, and phone number if an Administrator provides it to us. You can choose not to provide personally identifiable information to us. However, if you do not provide such information, your ability to use the Services may be significantly limited. We may collect "device information" anytime you download or use our iOS APP or Windows APP, or visit or use our Site or Web APP. We may collect device information such as your device's IP address, device and browser type, operating system version, and information about the websites you visited before ours and your activities using the iOS APP, Windows APP and/or Web App. We may also collect and use technical data and related information including, but not limited to, technical information about your mobile device, system and application software, and peripherals. If you have disabled cookies, however, you will be unable to view and access some or all portions of the Services. We will not sell or provide your personally identifiable information to any third party for direct marketing services or the advertising or marketing of third party provided goods or services. Also, with respect to personally identifiable information provided by an Administrator about Authorized Users, we will limit access to such information to personnel of Boardpaq who need to know such information for purposes of providing the Services. We may use personally identifiable information to respond to emails, to send notifications (from us or your Administrator), to provide customer support, to establish your account, and to communicate with you about the Services. If you are an Authorized User, your personally identifiable information may be shared with the Account Holder, Administrator(s), other Authorized Users associated with the account and others as designated by Administrator(s) and Account Holder, and your device information may be shared with the Account Holder and Administrator(s), and others as designated by Administrator(s) and Account Holder. We may use device information to help us run and maintain our Services, customize the visitor's experience, study traffic patterns, and generally learn about the usage of the Services. We may also use device information to facilitate the provision of software updates, product support and other services to you (if any), and to improve our products or to provide services or technologies to you. We may disclose device information collected from your computer or mobile device when you visit or use the Site to our affiliates and third parties, including advertisers. We may use and disclose personally identifiable information and device information when we have reason to believe that using and/or disclosing this information is necessary to identify, contact, or bring legal action against someone who may have breached our Terms of Service, End User License Agreement or who may be causing injury to or interference with (either intentionally or unintentionally) our rights or property, other users of our Services, or anyone else who could be harmed by such activities. We may also disclose device information and/or personally identifiable information to comply with any court order or request of a governmental agency and when we reasonably believe that the law requires it. In general, we will only retain personally identifiable information for as long as necessary to fulfill the identified purposes or any legal purposes. The Services are intended for general audiences. We do not intentionally collect personally identifiable information from users of the Services who are under the age of thirteen. Administrators can change their password, the passwords for Authorized Users, and other personal preferences used to access the Services by accessing their administrative page on the Web APP. If at any time you would like to access, modify, or delete your personally identifiable information (including your email address), you may contact your Administrator. The security of your personal information is important to us. We follow generally accepted industry security standards to protect personal information in our control. However, information transmitted on the Internet and/or stored on systems attached to the Internet such as ours is not 100% secure. As a result, while we use commercially acceptable methods to protect your information, we cannot guarantee the complete security or integrity of such information. You help to maintain the security of your personally identifiable information stored in our systems by keeping your username and password confidential and protecting against unauthorized access to your password and to your computer and mobile device (including your device on which the iOS APP or Windows APP is installed). Be sure to utilize the Logout feature when exiting the iOS APP, Windows APP or Web APP. California Civil Code Section § 1798.83 permits users of our Site that are California residents to request certain information regarding our disclosure of personal information to third parties for their direct marketing purposes. 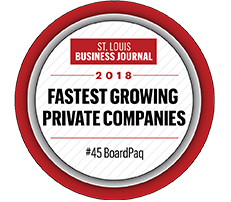 To make such a request, please send an email to support@BoardPaq.com or write us at: BoardPaq, LLC, 112 South Main Street, Saint Charles, MO 63301.